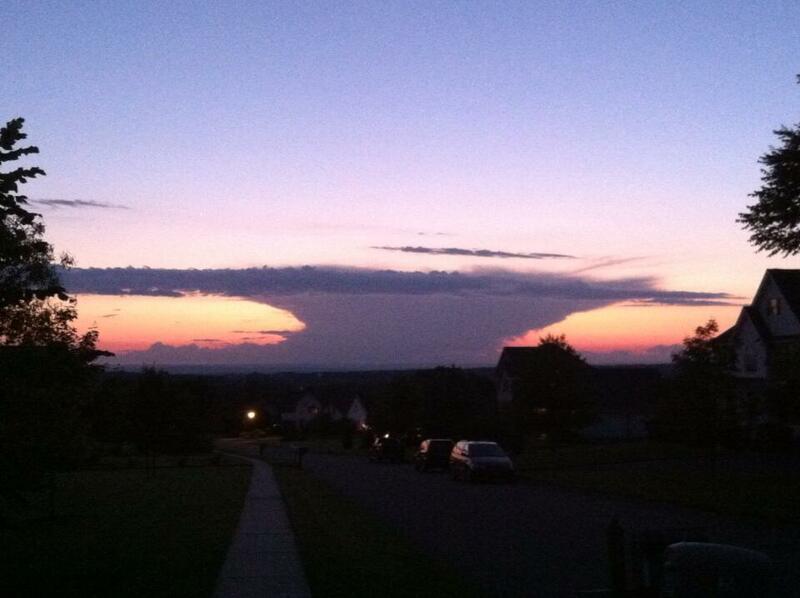 Around 8:00 yesterday Twitter came alive with pictures from viewers in Newtown and Southbury with incredible images of an isolated thunderstorm that was moving out of the Litchfield Hills into the Housatonic River Valley. The top of this storm only reached ~30,000 ft but it was a beautiful looking storm in person. It was totally isolated with the anvil being blown off to the southeast resulting in a crystal clear view from the southwest of it looking northeast at the low level mesocyclone. 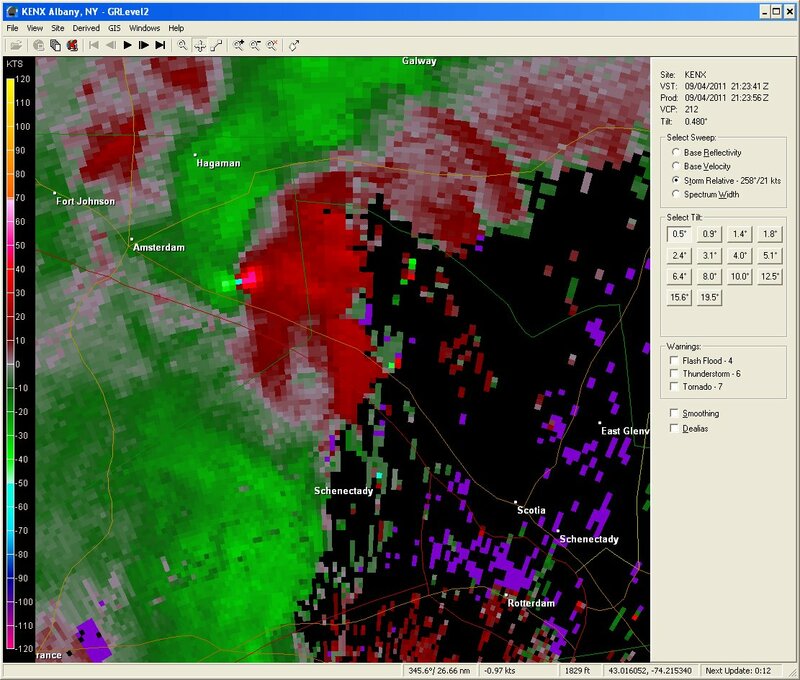 Radar shows there was a mesocyclone, albeit weak, with a rotational velocity of approximately 20 knots. The unusually clear view, plus the setting sun, lead to a really cool view of this thing that is pretty unusual for New England. In Southbury you can see a beaver tail with scud/inflow reaching up to the rugged wall cloud at the base of the mesocyclone. And on the other side of the storm in Southington you can see the cumulonimbus tower with the relatively low looking anvil and mammatus cloud spreading out the south and east of the storm. 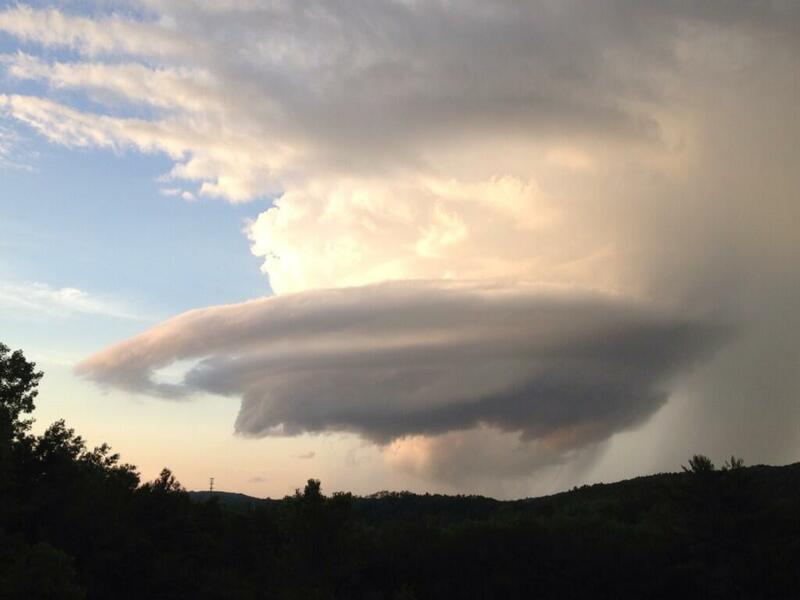 The storm has the classic supercell “mothership” structure with the rain free base and wall cloud under the updraft. There were other isolated showers and thunderstorms that died out in the state and produced some really cool looking anvils and structures. There was one I saw around 8:00 to the southwest of Hartford from a dying shower (nothing on radar… just a leftover cloud) and there was another really neat one to the northwest of Connecticut from a dying shower over the Berkshires. A quick look at some of the evening weather balloon launches shows an environment that wasn’t terribly impressive but sufficient for some scattered convection. There is veering with height on the lowest 3 km of the atmosphere on the Albany sounding (0-3km storm relative helicity around 145m2/s2) with just over 1200 j/kg of CAPE. This was sufficient for a small supercell and the updraft was strong enough to result in hail. 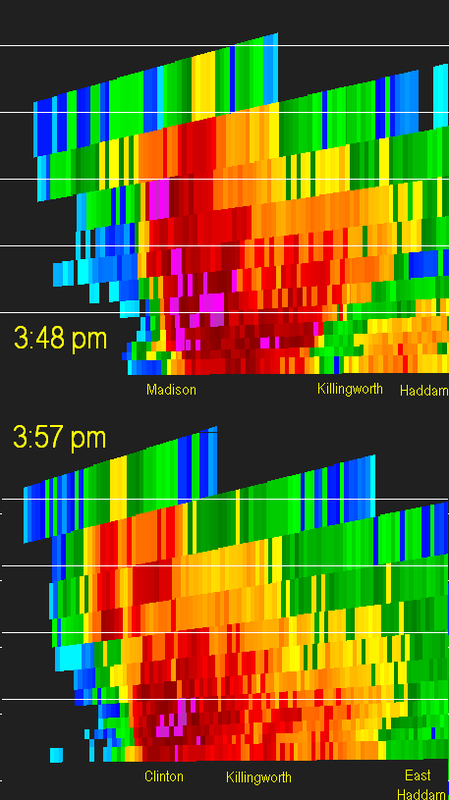 Radar showed a three body scatter spike over several elevation slices in Woodbury before the storm moved into Southbury and Newtown. We finally got a chance to see some storms after a quiet week in the plains. 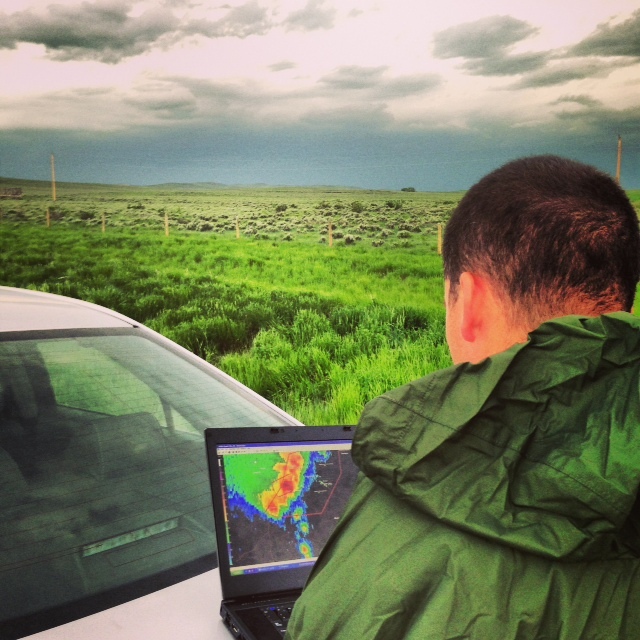 Even run of the mill supercells and squall lines are incredible to see out here with sweeping views across the plains. After starting the day in the Badlands and staging in Rapid City we had a bit of a conundrum. Storms fired in northeastern Wyoming while the area near and south of Rapid City into the Nebraska Panhandle was capped. 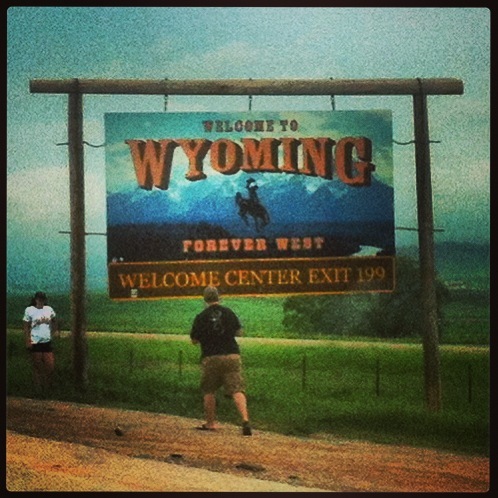 After waiting for stuff to start popping over the Black Hills and Nebraska Panhandle we decided to ditch the southern play and headed west of Rapid City on I-90 into northeastern Wyoming. There were several supercells to watch. One crossing I-90 in front of us and another to the south about 40 miles west of Upton, Wyoming. We played the southern storm and wound up in the town of Upton. We headed out of town briefly to catch the first storm that was moving through. We were under the anvil for a while with a beautiful mammatus display with a wall cloud under the supercell about 15 miles to our west. The storms were quickly “lining out”. What I mean by that is that discrete supercells were organizing into a line so the threat for tornadoes (and cool supercell structure) was diminishing. We moved south to Newcastle and then about 15 miles west to try and get to the southern side of the line to see if the southern storm would really fire up as is sometimes the case. While driving, we saw an incredible shelf cloud across the length of the developing squall line (30+) miles that was really a site to behold. We watched the storm for about 20 minutes in the Thunder Basin National Grassland (near the intersection of WY-450 and WY-116) which was wild. 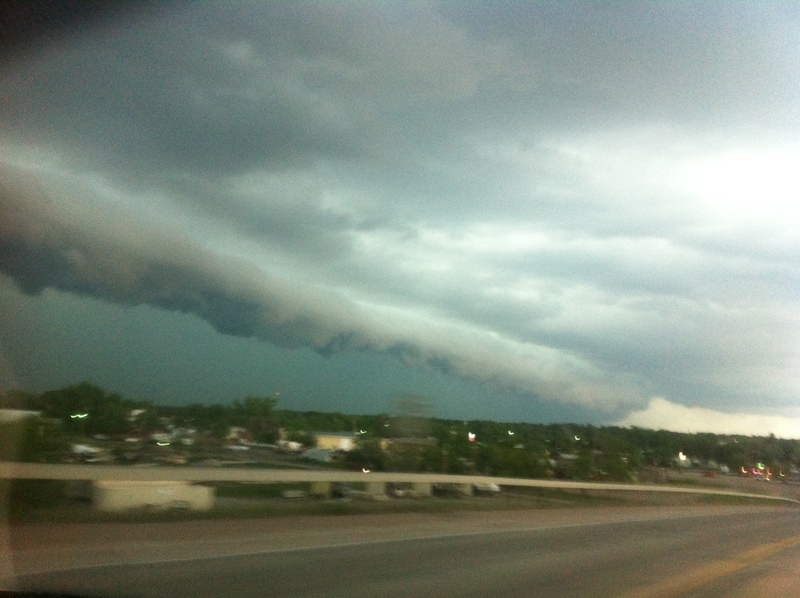 The clouds were about as cool as you can see to the south of the hail core and the winds were pretty gusty as well. The lightning was unbelievable. After watching the storm for a while we headed east ahead of the squall line back into Newcastle, WY and eventually toward Custer, SD. The storm decided to chase us a bit and while I thought we would beat it by several miles we got caught up in hail, really gusty winds, and some rain (though not very heavy). As you can see in this video, even though the hail started off pretty small, it grew quickly. We wound up getting a couple nickle size pieces in there after a while. That was just storm one. While crossing into South Dakota to find a hotel we ran into another line of storms that was strengthening (unbeknownst to us with no cell signal in the pitch dark) and had to deal with nearly 20 minutes of small hail in Jewel Cave National Monument. Hair pin turns and narrow roads in a national park are no fun during a storm like this! The winds up on the hills were ferocious. What made the storm incredible was the hour of constant cloud-to-ground and cloud-to-cloud lightning bolts that lit up the sky continuously. It was remarkable. While we didn’t see a tornado watching the supercell evolve into a severe squall line on the open plains was really, really cool. Definitely one of the neatest storms I’ve ever seen with a perspective that we’re never able to get in the hilly and tree covered northeast. We knew that these storms wouldn’t be tornadic after dark but I have no idea how or why people try to chase tornadoes after the sun goes down! Pretty crazy and nothing that I’d ever want to do. We’re hunkered down in Fort Collins, CO for the night. We’re going to visit some bars downtown and head to a Rockies game tomorrow in Denver before we catch our flight east. It’s been an awesome trip so far! 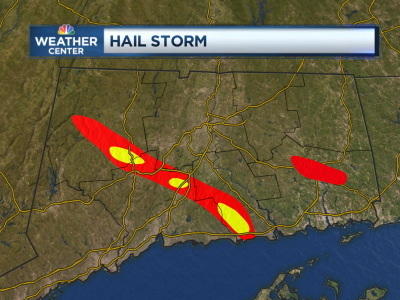 Getting pockets of severe hail is not unusual in Connecticut. Getting a several mile-wide swath of severe, and in some cases significant hail, from the New York border right down to coastal Middlesex County is unusual! The July 1 severe weather event was one of the more prolific hail producers I’ve seen in a few years. In fact the 2″ diameter hail reported in Killingworth and Clinton was the largest hail report in Middlesex County since 1995. This is where the largest hail fell on July 1st. The red shading is where severe hail (1″ or greater in diameter) fell while the yellow shading is the area that received significant hail (2″ or greater in diameter). In general significant hail is enough to start causing property damage. The evening 00z OKX sounding showed enough instability to produce severe thunderstorms (CAPE about 2000 j/kg). The 12z OKX sounding was fairly similar. The question was how much would the boundary layer dry out and during the day. 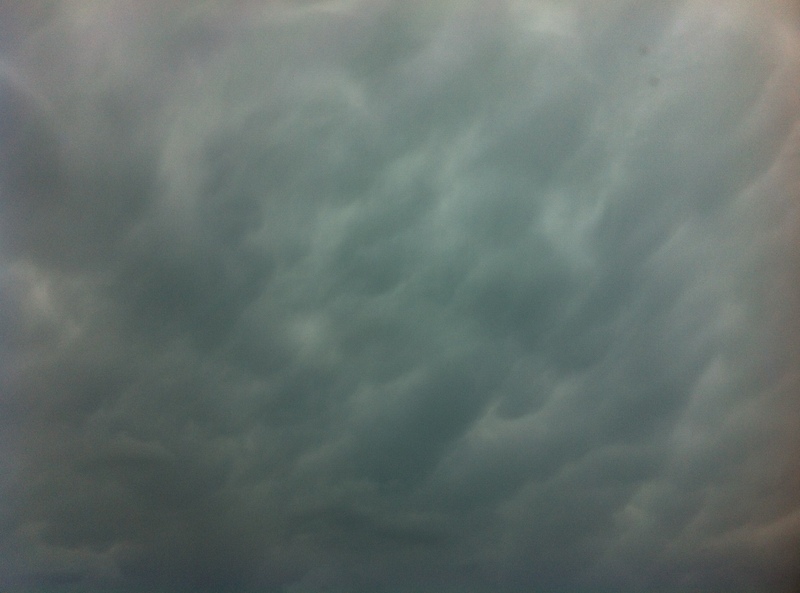 As it turned out the boundary layer remained relatively moist yielding more impressive instability than forecast. The 3 p.m. OKX Vad Wind Profile showed slightly more shear than modeled earlier in the day. More backed winds in the boundary layer not only helped keep the BL moist when combined with a somewhat more veered mid level flow than models had indicated resulted in a favorable shear/instability combination for supercells. While thunderstorms were expected across the state thanks to a solid 500 mb shortwave rotating around a trough overhead a combination the somewhat more impressive instability and shear than modeled lead to a more impressive severe weather event than I originally anticipated. Almost all of the damage and sig severe reports came from one beast of a supercell that developed near the Catskills and moved into Connecticut. 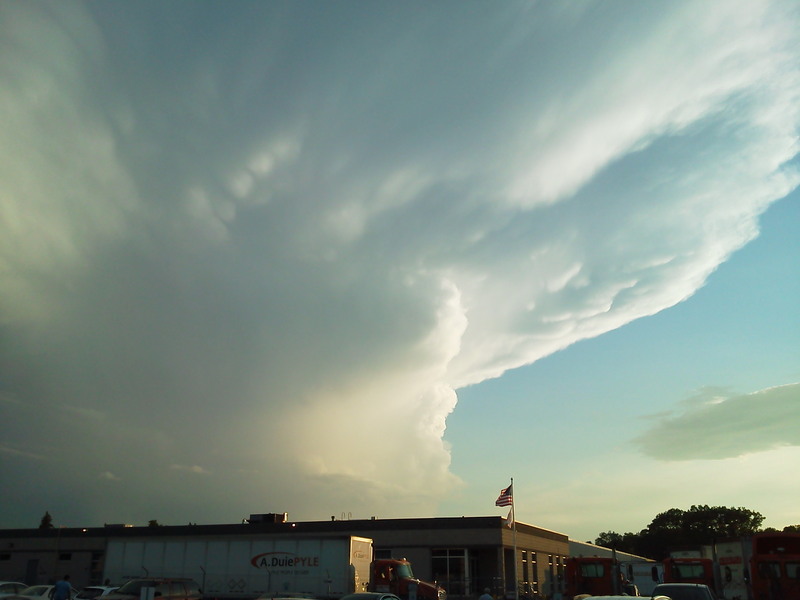 This is what the supercell looked like prior to dropping egg size hail in Watertown. CLASSIC! 0.5º ENX Base Reflectivity and Storm Relative Velocity at 2:48 p.m.
You can see here the strong mesocyclone at about 6500ft AGL (also visible at the 1.4º tilt at about 13,000ft AGL) and a V-Notch or what I prefer to call a Flying Eagle. 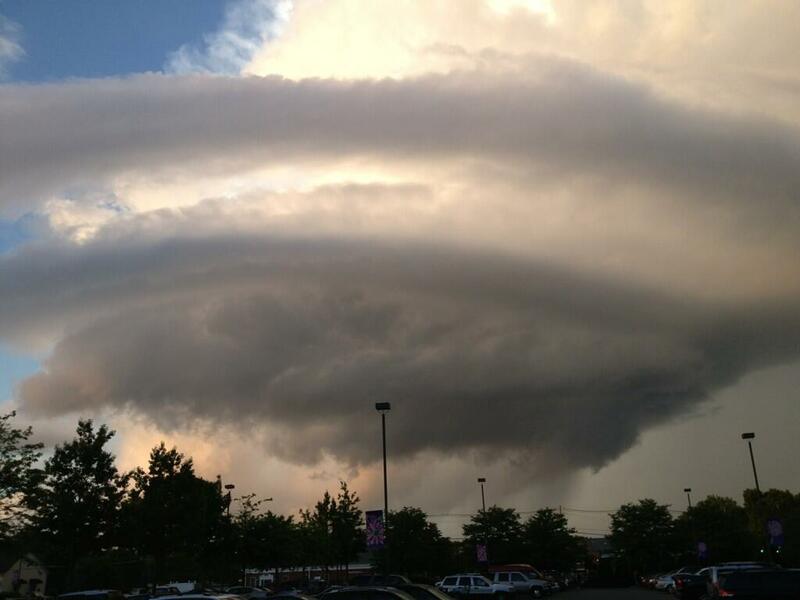 This develops as air is forced around the core of the storm – indicative of a very powerful updraft. In addition three-body scatter spikes or hail spikes are visible from the storms large hail core. 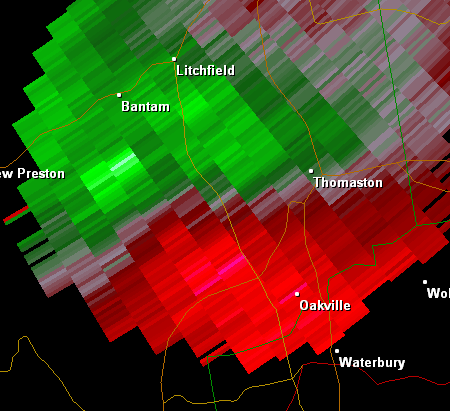 Other tilts show the 65 dbz level reaching 27,000ft AGL level. 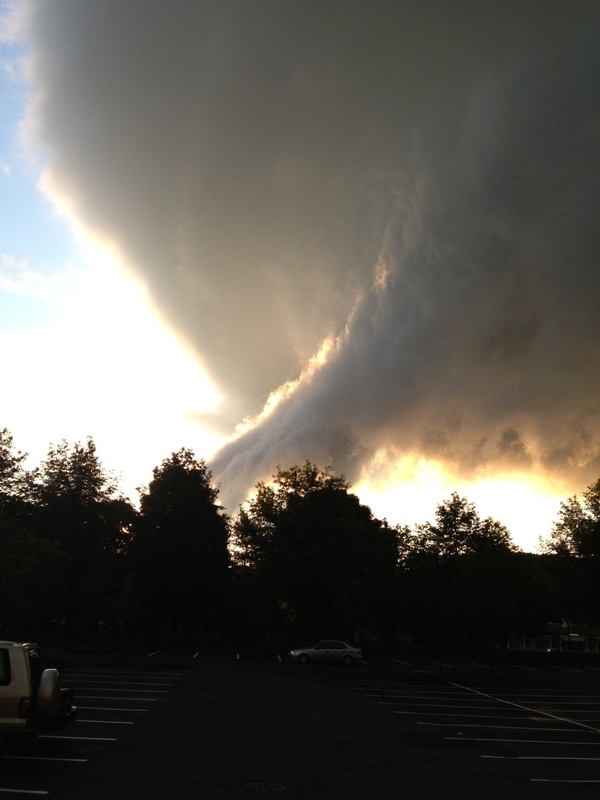 Yup… that’s a big hailer! The supercell also showed another classic signature on doppler radar with strong storm top divergence (over 100 knots). This storm relative velocity image at about 35,000 feet AGL shows a strongly divergent flow along a radial near the top of the storm’s updraft. This is why you get a beautiful anvil from a mature cumulonimbus cloud. Generally over 100 knots of storm top divergence means big hail is fairly likely. The supercell continued southeast right to the Sound, somewhat reminiscent but not as impressive as the June 1995 storm, eventually dropping golf ball and egg size hail in Clinton and Killingworth. Here are two vertical cross sections from the Sound north-northeast into Middlesex County. The y-axis is the vertical with each white line equal to 10,000 feet AGL. While North Madison only reported hail to the size of quarters Killingworth and Clinton were slammed with significant/2″ diamater hail as the storm’s core collapsed. The suspended hail began to accelerate toward earth as the updraft weakened dropping the largest hail in Middlesex County since the 1995 super-hail supercell which dropped baseballs in Deep River and Essex. Each severe weather event unique and this was no exception. Our models did not do a particularly good job with either boundary layer moisture, boundary layer veered winds (those 2 really go hand-in-hand) and mid level lapse rates. Using actual soundings, observations, and data like OKX’s Vad Wind Profile was vital in determining the severity of the threat once things developed. Though not particularly well forecast this event was fascinating to watch unfold on Doppler Radar. A strong line of thunderstorms across upstate New York spawned a tornado yesterday near Amsterdam. 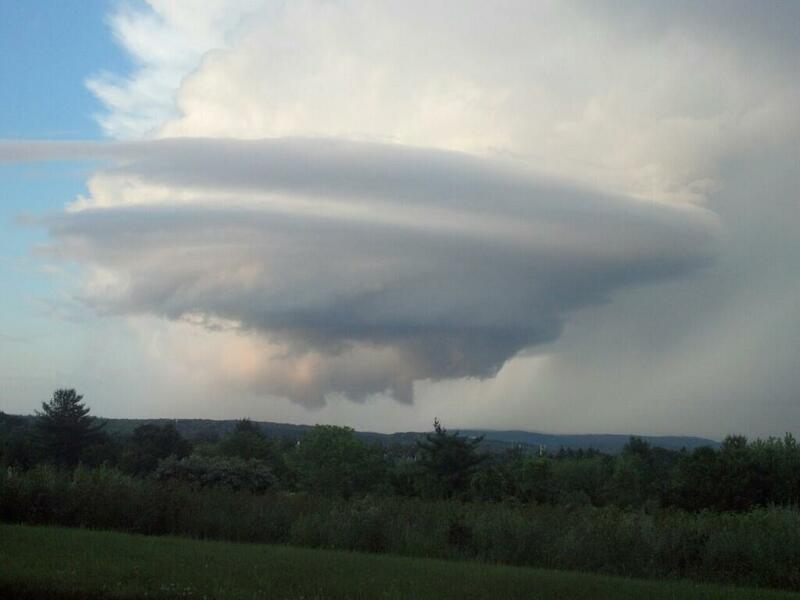 A supercell developed in a bookend vortex on the northern portion of a squall line that was moving along the New York State Thruway west of Albany. Doppler radar showed the low level mesocyclone extremely well with one of the more impressive couplets you’ll see in the northeast. It only lasted a couple volume scans before the circulation weakened but it was long enough to produce a tornado. The tornado was captured on video by a recent SUNY-Albany graduate with a degree in meteorology! She was pulled over at a rest area on the Thruway when the she spotted the tornado crossing I-90. Fast forward the video to about 5:30 to see the tornado.